The Federal Procurement Data System (FPDS) is a powerful tool vendors often overlook. As a database of all awarded contracts valued at $3,000 and higher, FPDS can help business owners scope out their competition and stay on top of market trends in Federal procurement. 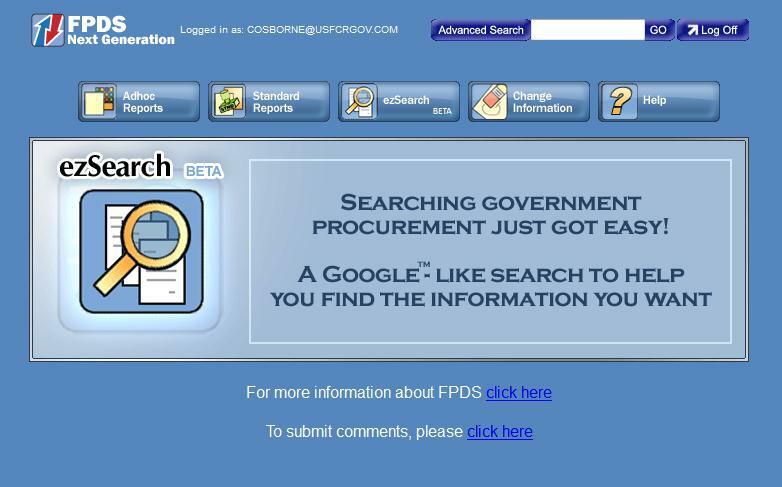 FPDS ezSearch allows you to search awarded contracts valued at $3,000+ and contract modifications of any dollar amount. This information is important to contractors because it helps determine which agencies in the Federal government are buying particular products and services. The results will also clue vendors in on who these contracts have gone to in the past, and help them position and market themselves appropriately. To use ezSearch, type your search criteria in the ezSearch bar on the homepage. It’s best not to enter more than one criterion from the same category. For instance, don’t type in two NAICS codes or two states in the same search. Once you submit the search, you can further refine or sort the search results. Click “View,” next to an Award ID number, for details about that contract. To use the reporting function, you will need to be logged in to FPDS. Clicking on the “Standard Reports” button will allow you to choose from quite a number of reports in different categories. As an example, clicking “What” and selecting “Total Actions by NAICS” will allow you to search and find out how much the Federal government is spending in each NAICS category. You also can filter by dates and agencies.